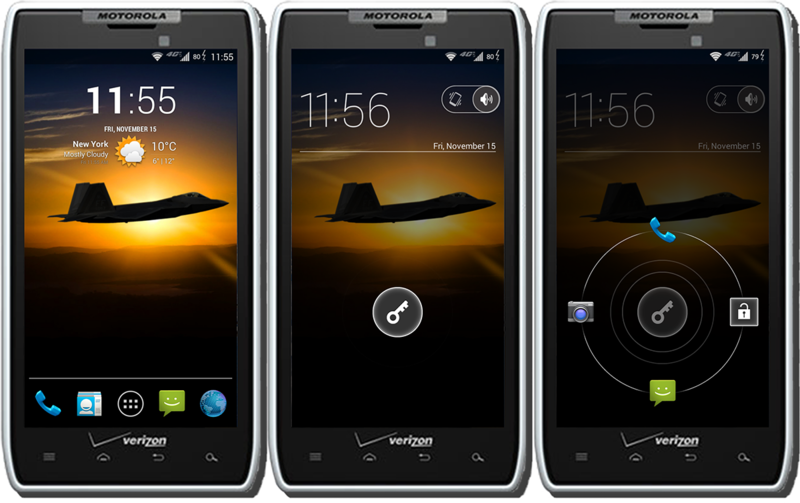 Please Note: This is ONLY for the Verizon DROID RAZR and the Verizon DROID RAZR MAXX which are running the Ice Cream Sandwich already. If you are on Gingerbread or Jellybean you cannot use this to upgrade or downgrade, you will brick. still not found, please factory reset your phone for the root to work, this is of course if installing the drivers did not work). Install Voodoo's OTA Rootkeeper App (Updated). With the phone booted and on USB Debugging enabled (not USB Mode Mass Storage as well), this will install the app. Install Safestrap Recovery App (ICS version 2.11). With the phone booted and on USB Debugging enabled (not USB Mode Mass Storage as well), this will install the app. Thanks for supporting and using my programs! I love http://www.droidrzr.com/ and consider it my android home. The BEST and MOST TALKED ABOUT stock ROM, made by one of the most popular devs here! The tweaks included in this ROM are exclusive to this ROM and may NOT be used by anyone without permission. The ROM itself, stripped of all tweaks may be used as a base as long as permission is asked prior to posting. After this is done set profile with setcpu for screen on. make it exclusive priority 100. If at this point you wish to change frequencies open smanager app. Press green arrow at top right until you see / then go to system/ etc/init.d open it. You will see a file named 90modules open it. Select edit at the top. Open directly no copying! Use sm editor to open it if it asks. Edit the frequencies to your liking. Press the back arrow on phone. If it warns you about bricking device select brick. Remember to change profile if you use setcpu. This last step is optional if you are unsure about editing leave it. I am not responsible for your phone imploding on itself or dividing by 0 or starting thermo-nuclear war with North Korea! 4.2.2 Gallery will FC when you try to edit a picture. You Must Be On The Jelly Bean Kernel 98.72.16 To Flash This Rom!!! If you like my work and would just like to show your appreciation. Please click the "Like" button!!!! Hope you likey, if so hit da button! Only you are responsable for what you do to your phone. Whirleys for the extra govs and schedulers. 24V- he the man! and always there for help! You must be on JB Kernel to flash this rom. After setting up phone reboot 2 times to enable all tweaks. See post 3 for screen shots! If you would like to donate to anyone involved in making this ROM pm them and ask how. Thanks W0017roid for the video! I do not want anyone stuck with this. Please please please, put the 6.16.211 update zip on your external SD card before doing ANYTHING! If you do an option and end up in a semi-bricked state awaiting install and you don't have the update on your external SD card you aren't gonna have a good time. It will NOT magically appear there by itself. I mean for this utility to be used by those who are on Gingerbread and want to go to Ice Cream Sandwich (6.16.211), and for those who are on Ice Cream Sandwich and want an easier unbricking tool and rooting tool that includes ICS versions of Bootstrap, Safestrap, and the beloved OTA Rootkeeper by Voodoo. 2. Implementation of my Unstuck Utilities into one simple function. 3. Dan Rosenberg's new ICS 4.0.4 Root method. 4. My implementations of TPSparky's 4.0.3 root method. You can use option 8 to use this root method, and option 9 after (if you choose). 8. For use with the 4.0.3 root method (option 4). 9. For use with the 4.0.3 root method (option 4). In light of recent events, I've donated $100 of your donations to One Fund Boston (https://onefundboston.org/), a fund set up for the families of those affected by the Boston Marathon bombings. I encourage all those thinking of donating to me to consider donating to a reputable charity organization instead (or in addition). To run the exploit (currently Windows only), download and extract the entire zip file, ensure your device is connected via USB, ensure you have the latest Motorola USB drivers installed, ensure USB debugging mode is enabled on your device, and double-click "run.bat". PLEASE FOLLOW THE DIRECTIONS IN THE EXPLOIT CAREFULLY. Please do not re-host or modify this exploit without asking permission first, since this makes support difficult and annoying. KOA (KOH-AH) IS THE HAWAIIAN WORD FOR "SOLDIER"
for making all of this possible! IF YOU INSTALL THIS ROM WITH BOOTSTRAP, DO NOT COMPLAIN ABOUT STUFF NOT WORKING. SAFESTRAP2.11 IS A REQUIREMENT FOR A REASON. Van: for bringing smiles to my face when I was stressed out, even after all he's been through. Alex, Russ, Gerland, Aaron and DemoManMLS: for being my testers and not being mad about having to wipe data every time lol. Thanks Guys! Would also like to thank all the other developers here. EmericanX and anyone else. If I forgot to add your name, it's not personal. There are just so many great devs and it's hard to remember all your names lol. 3. Your name added to every OP as a "contributor." Myself, Droidrzr.com, DHacker, Hashcode, nor anyone else, is responsible for what YOU DO TO YOUR PHONE! You take on ALL RESPONSIBILITY by flashing this ROM and the gapps package. So what exactly is KOA ROM? KOA ROM is a ROM that will stand out. It has features, speed tweaks and battery tweaks that no other ICS ROM has right now for the RAZR. Disabled kernel logging for speed. Have a working nand backup!!!!! Cropped resolution for screenshots and tasker, also when rotating screen. Some games will have issues, if you find one that does, please post here. MAKE SURE YOU HAVE AT LEAST 80% BATTERY BEFORE DOING ANY OF THIS! Now in recovery, select "safe boot menu"
Now select "Toggle Safe System"
Now select "Yes-Enable Safe System"
Download ROM and gapps from links provided below. Upon reboot, wait for about 30-45 seconds, 3G (4G if you're in a 4G area) SHOULD start on boot. 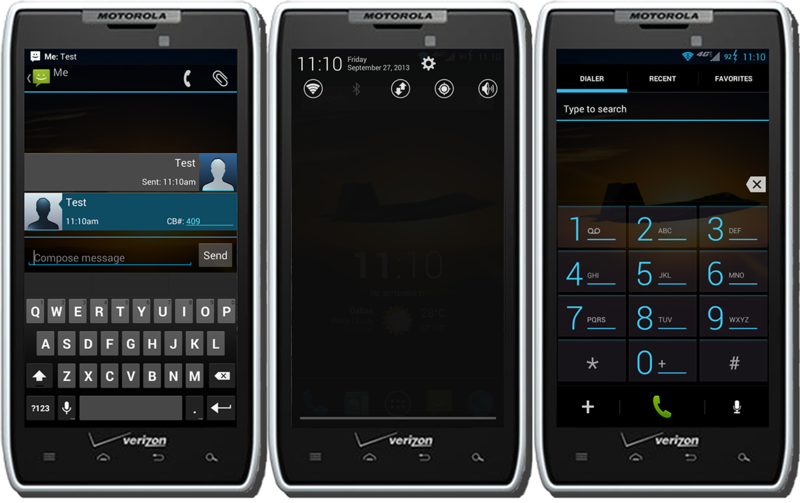 #72521 Droid Razr Utility 1.81 [Windows] For Verizon Droid Razr/maxx Only! KOA is the Hawaiian word for "Soldier." dhacker and hashcode for making these base builds. andlaw for being the other half of the 808BoyZ and for helping me out with stuff along the way. mattlgroff for being an inspiration and keeping me on my toes. Vantenkeist for being a friend when I need one and not letting me stop development. gerland for always asking me when i'm going to come out with another ROM lol and keeping me company in the chat room when i'm waiting to help people out. If I left your name out, it's nothing personal. I just have so many people to thank that I can't remember everyone! 1. Download links to updates will be PM'd to you before they are posted. 2. A chance to test any ROMs or Themes that I'm working on. Myself, Droidrzr.com, BDH-ROMs, dhacker, nor hashcode0f are responsible for what YOU do to YOUR phone! By flashing this ROM and the gapps package, you accept all responsibility. Lots more features to come......we're just getting started! Make sure you have the latest version of Safestrap installed!! NO OTHER RECOVERY IS SUPPORTED AND NO BOOTSTRAP WILL NOT BE SUPPORTED! Normal CM10 bugs like the screen rotation shrinkage. Maybe more, you tell me! Android is all about choices. .. so here's another three choice's for AOSP ROM! Credit: Cyanogenmod :: AOKP Developers :: STS-Dev team for the Github commits :: Dhacker for all of the things he does for the android community & answering all my questions on Gtalk :: hashcode for ICS safestrap to flash with :: XDA for all the goodies to learn android :: DroidRZR for the amazing community and the place to call home!! :: What I have here are three different Developer sets of ROM's to choose from! They are all very popular in terms of stability, better battery, speed, ROM customization, fluidity etc. I have compiled them from STS-Dev team source, so they will have most of the same bugs/issues other JB builds currently have, and then possibly some others.. As with all of my ROM's these are themed very dark., CNA being the darkest! The ROM's come pre-loaded with my BWicons as a system app, it just needs to be enabled through APEX theme settings (this will theme the app icons found within the app drawer). I have put a lot of time into blacking out the entire system ([framework]), apps, and Gapps., and it has been a work in progress for months, and i wont do it any other way, so if you don't like darkness, then this ROM is not for you. If you need fully working bluetooth, this ROM is not for you. If you need HDMI/Webtop, this ROM is not for you. :: These are still in an alpha stage as in terms of development, but by all means can be used as daily drivers! Known Bugs: Bluetooth bug (when bluetooth is on but not connected to a device = loss of all audio), MMS bug (use GOSMS), and YouTube wont play unless you (open Settings.. General, and enable High Quality on mobile). "so I do ask that if you leave a comment to report a bug, please state  Which ROM you are running..  what exactly the issue/bug is in detail, help me help you!" Aloha and Mahalo for the donations and continued support~ BW FTW!!! eXtra Mods: StockBattery - reboot to recovery, flash, profit. ..
eXtra Mods: none available at this time. ..
eXtra Mods: StockBattery :: circleMod - reboot to recovery, flash, profit. ..
([ Shadyblue ]) :: CM10 theme chooser theme, by wulf :: click HERE for the thread. ..
([ BWicons ]) :: Download, move into your system/app directory with (rw-r--r--) permissions, open Apex settings theme settings, and apply BWicons. ..
([ GOSMS&Theme ]) :: Download, reboot to recovery, flash zip. After the phone boots up, disable stock mms (or disable the notifications and auto retrieve messages), open GOSMS, hit the menu key and enter themes, and select the ICS theme that has been preloaded = profit. Open SMSpopup, Notifications- default notifcations, disable the Show a popup, enable notifications. (change icon if you want), then vibrate, can set pattern (i choose custom; 0,800), then can set the LED color.... then go back. then back again. (now your back to main menu) open Additional Settings, turn off Quick Reply, Disable the Button configurations, Disable Screen On for Popup. Enable privacy mode, then check the very last box,.. Restrict Popup! A truly blacked out experience for the RAZR. EVERYONE ALWAYS ASKS SO I'M MOVING THIS TO THE TOP IN BOLD ITALICS UNDERLINED ETC ETC. - THE WAY THAT MOTO NAMES THEIR UPDATE FILES IS NOT THE DESTINATION BUILD YOU ARE GOING TO BUT THE BUILD/VERSION YOU ARE COMING FROM. EXAMPLE: THE 6.11.748.XT912 ZIP IS AN UPGRADE FOR 6.11.748 TO 6.12.173. - NOT 6.11.744 TO 6.11.748. It seems there is some confusion on the procedure on how to install this leaked update. I want to clarify for those who want to use it (it has some updated radios, bump in android version to 2.3.6, updated camera, etc). Step 1: Prerequisite step basically. You must be running stock (current ota updated version to 6.11.748) and still have all your 748 bloat intact etc etc. Anything that you couldn't uninstall without root needs to be on the phone. This includes things like editing the swype files so that you could install betas. If you are not in this boat, chances are extremely good that you are going to fail the current system verification phase and the update will not install. Also, make sure you have 50+% battery. MD5 of the update package (Blur_Version.6.11.748.XT912.Verizon.en.US.zip) should be aa7fe6290c0d3a60253922bac413da02. You've been made aware. Step 2: Disable Safestrap via the app. You do not have to remove the apk itself, but the system needs to be disabled. Step 3: Install Voodoo OTA Rootkeeper (free from the market). Open it and hit protect su (all the boxes should be checked green at this point). IF YOU DO NOT DO THIS STEP, YOU WILL NOT HAVE ROOT ON THE NEW BUILD. CURRENT ROOT METHODS DO NOT WORK ON ANDROID 2.3.6+. If you are not currently rooted and want/need to be, you need to root at this point with voodoo protecting root before you proceed. Step 4: Drop the update file Blur_Version.6.11.748.XT912.Verizon.en.US.zip on your EXTERNAL SD card. File can be downloaded here. Step 7: Press Vol+ and - simultaneously to get the on screen menu. This menu behaves like CWM/SS for navigation. Step 8: Install the update file on your card. It takes a while. It's going to verify both the file and your current system before it proceeds. If your phone fails the current system check (most common) that means something isn't factory in your phone's system files and you'll probably have to use RSD to fix it. (See my FAQ post for the link to how to use that. I'm too lazy to explain that here, or I will be ninja edited to give a link to the Fast boot thread: http://www.droidrzr....fastboot-files/). Step 9: When the system reboots load up the voodoo app. You'll notice that you no longer have root. Hit restore su. Step 10: Open Safestrap and enable it again. EDIT by mattlgroff: Here are the /preinstall/ folders to replace your current ones if you have uninstalled SafeStrap and are still having issues. Use Root Explorer, delete your preinstall folder and paste in one of these depending on what version you have and it should let you upgrade/downgrade to the version you want to. 6.11.748 Preinstall Files (Provided by mattlgroff. Use these to upgrade from 6.11.748 to 6.12.173 or update to another update/OTA not yet known at this time by replacing preinstall folder to fix Status 7 errors). 6.12.173 Preinstall Files (Provided by mattlgroff. Use these to downgrade to 6.11.748 or to update to another update/OTA not yet known at this time by replacing preinstall folder to fix Status 7 errors). 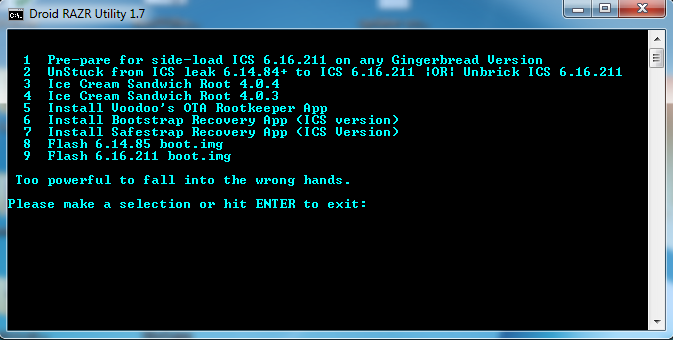 For those of you who WERE rooted & protected root with Voodoo, installed the ICS leak & subsequently lost root like I did, dhacker29 tweeted out some helpful instructions to remedy the issue! Download Android Terminal Emulator for free from the market. 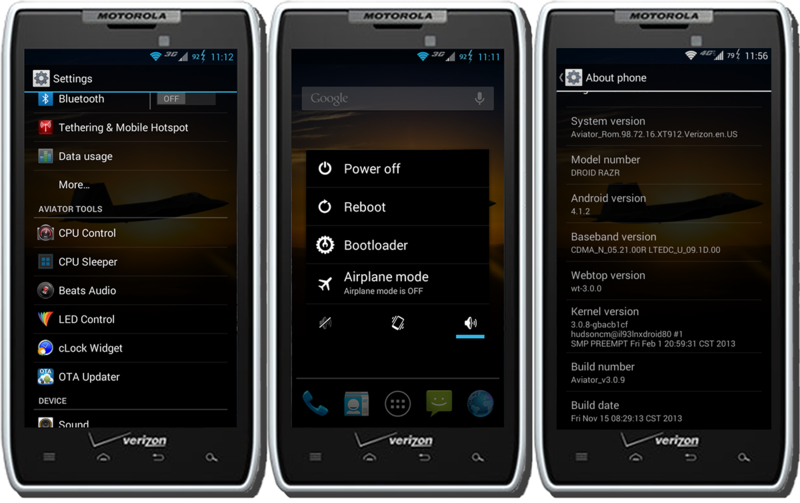 #169512 [ROM] [4.1.2] Aviator Blur - v3.0.9 [11/15/13] Pick Your Own Color! Fly higher with Aviator! Please do not post this anywhere else without prior permission. Click on icon to got to that Aviator Version OP. NOTE: Some of the screenshots show the optional "White" color theme. You'll notice it in the status bar of the screenshots. Init.d tweaks - Battery and Performance based. Volume rocker change music track mod. Animation on notification pull down (hold the bottom bar on pull down) - Pictures removed, but code remains. ES File Explorer (Can be uninstalled, not a system app). Titanium Backup (Can be uninstalled, not a system app). Battery Calibration (Can be uninstalled, not a system app). No Frills CPU Control (Baked into settings. I.E. go into settings). CPU Sleeper (Baked into settings. I.E. go into settings). OTA Updater (Baked into settings. I.E. go into settings). Beats Audio (Baked into settings. I.E. go into settings). LED Control (Light Flow Lite) (Baked into settings. I.E. go into settings). Chronus cLock widget (Baked into settings. I.E. go into settings). Custom theme – Wallpaper, boot animation, 3G/4G icons, and semi-transparency. STS-Dev-Team - For all that they do/have done. lownslow200sx – 98.72.8 Deodexed base and general help. mhous33 - 98.72.16 Deodexed base. Nitroglycerine33 – OG pull down toggles from ICS. prstorero – Help with pull down toggles and reboot menu. mattlgroff – Init.d and ADBD installation. 24v – Pull down animation and general help. Halo13 – Pull down toggle help. East2West – Port over of volume rocker to JB and overclocking modules. Dtrial, artur0588, and HSD-Pilot - GSM Patch information. jl90 - Safestrap 3.60 installation help. Transfer ROM zip file to SD card. Activate a different ROM slot or Stock slot. Delete the ROM slot you want to use. Recreate the ROM slot with desired slot size. Go into Settings>CPU Sleeper. Check "Enable auto-start on reboot" (First Line), then "Start Service"(Second Line) (Press twice). Let phone settle for 5-10 minutes then reboot for best results. Charge to 100% for battery calibration or use battery calibration app from Play Store. PICK YOUR OWN COLOR THEME! These are basic color themes which changes only the framework. Do not use the computer utility to remove toggles or install the simple battery. You can still use the overclock function of the utility. (Any version below v3.0.6 requires Safestrap 3.11). LOOK AT POST 3 FOR EXTRAS! Want to show your Aviator Support with a custom Aviator signature image? Edit your profile and go to signature. Please feel free to use anything here for your personal, or public use. If you do use something from this thread, all I ask to to be given credit where it is due. You do not need to ask for written permission unless it is otherwise stated as part of a forum's kanging policy. What I have here is a Jellybean [98.72.16] OTA based ROM thats been de-odexed, de-bloated, zipaligned, and I removed as much blur as possible, replacing with AOSP counterparts to ensure a fully working ROM, including SMARTACTIONS!! The main system (framework), google apps, and most of the included apps have been blacked out! This UI is the darkest you will find for the RAZR, and a lot of time has went into theming everything dark, so if your not a fan of darkness, then this ROM is not for you! If you find it being too dark, you can always load an icon pack through APEX theme settings to add some color within the app drawer and homescreen. You Must be on the JB (OTA) system as the kernel is needed to power this custom ROM, and you need to use Safestrap 3.11 recovery to flash the zip~ If you have any suggestions/issues please do feel free to leave your feedback.. as its always greatly appreciated! Aloha and Mahalo for all the donations and continued support! BW FTW!!!!! !! Gmail v4.2 - Inverted BW edition. .. Play v3.10.9 - Inverted BW edition. ..
YouTube v4.1.23 - Inverted BW edition. ..
AOSP Calculator - Inverted BW edition. ..
AOSP Email w/ Exchange - Inverted BW edition. ..
APEX Launcher v1.4.4 - custom/default home launcher, with the ability to load custom icon packs and launcher themes. ..
APEX Black - 'skin' to be selected in APEX themes settings. ..
Blacked out system - SystemUI/framework-res have been blacked out and themed minimal. .. 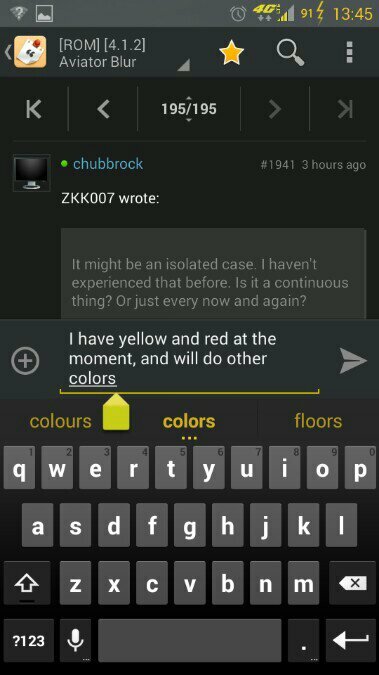 Blur Messaging - Blacked out 4.1.2 blur Messaging, with white emoji's instead of green ones. ..
Build.prop tweaks - for a fluid/battery sipping experience, aka Widow butter. .. Custom Bootanimation - based off the stock animation. ..
Google Deskclock - 4.2 Google alarm clock, stop watch/timer and countdown. .. Known to cause blackouts nation wide. .. Requirements :: on the OTA JB system or Dual.boot using the ICS kernel + ROM compatibility kernel flasher. .. using Safestrap 3.11 Recovery! () Download and move zip/s to sdcard. ..
() Reboot into recovery. ..
() Create a Nandroid. ..
() Select ROM slot and Wipe ([data/cache/dalvik-cache/system]). ..
() Go back, Choose Install. ..
() Install the ROM zip. ..
() Reboot system to complete install. ..
([ ROM ]) :: 2013-3-17 :: How-to Install Black Widow HDish on your XT912 device, watch here! Avoid updating apps through Play that have been themed to avoid losing the theme-work, as it will be broken once they are updated (you can choose to uninstall-updates through App Info to return to the previous themed version at any time). Flash HDgtalk; after first boot! no need to wipe~ just flash. ..
Leave feedback. .. help me :: help you! and please read posts 1-4 before asking questions, thanks! Motorola for the hardware and some blur icons edited and used in BW. ..
Google for Android and always being there when I have questions. ..
XDA for all of the goodies and tutorials to learn android. .
Hashcode for the updater script and Safestrap to flash with. .. epic. .
BigDaddyHicks for his deodexed base to build from. ..
Dhacker for all of the things he does for the community & answering all my questions on Gtalk!! Mattlgroff for his ADBD insecure script, and showing me how to integrate a custom boot logo into the ROM package, and countless other things he does for the community!! Bytecode for his help with setting up custom init.d scripts for the use of extra modules. ..
prstorero for the guide on how to Mod the reboot menu into my ROM, and for answering all my questions on Gtalk while doing so. ..
24v for showing me the ropes on how to use Apktool and for creating bad rear end themes for my ROMs!! wulf for always answering my questions and helping me, and for always making bad rear end themes for all of my ROMs!!! Android Does for APEX launcher.. the best android 4.0+ home launcher on the market! CyanogenMod for DSP Manager. ..
Koush for the new Superuser app/binaries and for being OPENSOURCE. ..
DroidRZR for the amazing community and the place to call home. .. and anyone else who as ever helped along the way! 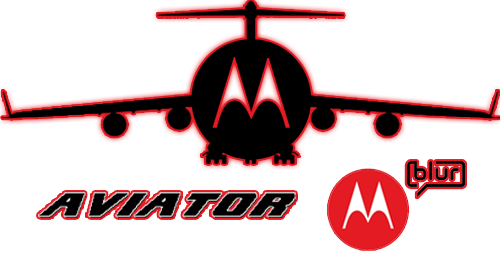 A truly blacked out experience for the RAZR! #172141 Root achieved for JB OTA RAZR/MAXX XT912 (RAZR Blade)! So our fearless root master, Dan Rosenberg (djrbliss), has successfully achieved root for the JB OTA and it's here first on DR.com! 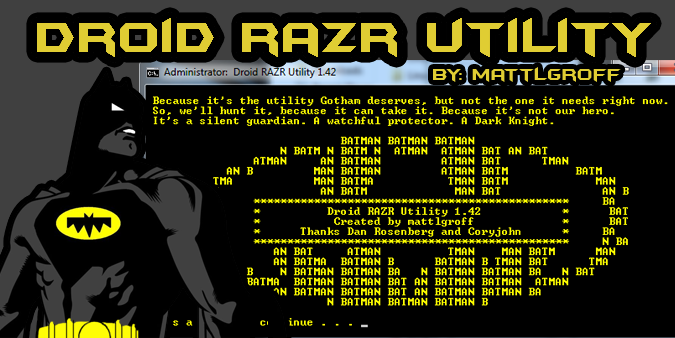 This root exploit is applicable to the RAZR and RAZR MAXX (XT912). This means all of you who lost root through the OTA update will now be able to root your devices once again. A huge thanks to Mr. Rosenberg for all his hard work and dedication! He is the first one to achieve root so, as promised, the bounty is his. Here is a link to the Root Exploit Release and Discussion thread. -Download the zip file and extract. Again, huge thanks to Dan for his diligent work! Well it's Friday. rickyheferle and I both pulled this update early yesterday morning (very shortly after it was compiled) so I want to make sure that he gets mentioned. After the shenanigans of last release we're sure of install method this time around. New build for you checking in @ ~350 megs (yeah. that's about 100 megs smaller than the last leak). I've been playing with it since yesterday morning and it's definitely cleaner. Moto's definitely been working hard to get this ready to go. This is a leak for users currently on 6.12.181.XT912. IT ABSOLUTELY WILL NOT INSTALL COMING FROM ANY OTHER BUILD/VERSION. As usual, we at droidrzr.com are not responsible for any errors, bricked units, thermonuclear war, etc related to anything posted on this site. You accept all responsibility for your actions by using these files and agree that you're not going to swap out your unit with VZW/Moto/Insurance when you screw it up. - When receiving a call, there's a new button in addition to your answer/ignore so that you can respond with a text. Installation is NOT RSD/Fastbootable. - Files were pulled for this reason. Only some people are successful. Voodoo protects root during upgrade process. 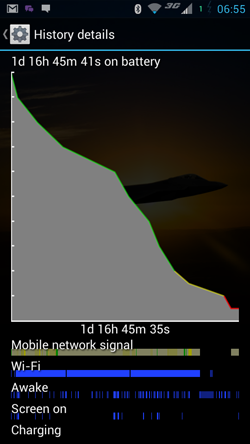 - Battery charge information will report incorrectly after reboots most times. Solution: Don't reboot the phone very often. If you charge/discharge it, it will fix itself. - Need verification on new build. May be fixed. Please comment. - Outbound Calling/Texting/Data while roaming are not possible. Solution: No known fix - Need verification on new build. May be fixed. Please comment. 1) Use RSD and go back to 744 or 173 depending what files you have available. I would say use Matt's utility but there are too many versions floating around and some people are having hit or miss results with it. My guess is people are using the wrong options when using it. As RSD has no options for you to screw up and will just blanket nuke everything, I suggest that route. 2) You have executed a factory wipe immediately before or after the above step. I'm sorry. But whatever issues you're having could be related to your current setup and/or data. Get rid of it and start over. 3) You have re-read and COMPLETELY understand the steps listed in this OP. There are many people asking questions that have answers clearly stated in this OP. For those having issues restoring root with voodoo after install go here. 1) Download Files pulled. (right-click and save as if you have issues downloading either of these 2 files) and make sure you're above 60% charge. The update takes a while to install and you don't want it to die mid-update. Trust me. Safestrap/Bootstrap must be disabled. 2) Make sure you have ROM Manager, ES File Explorer (Make sure root access and system writable are enabled in the ES file explorer settings), and have root access to your system but are on an otherwise stock COMPLETELY UNMODIFIED installation of 181. In ROM Manager, DO NOT INSTALL CLOCKWORKMOD. Just have the ROM Manager app itself installed. 2a) If you plan to retain root after the update, update the Superuser.apk via the market and open the app and go to options/preferences (depending on your version) make sure your binary is up to do date in preferences (3.0.3.2+). Also make sure you have voodoo OTA Rootkeeper protecting your root after those updates before proceeding. I personally used motofail to root once I got to 173. I didn't bother rooting til I got there as it's not required and when I RSD it takes me all the way down to 744. Alternatively, the root method here (click anywhere on this sentence) should retain root post-update without fail if you use it there will be no terminal necessary to retain root. Only Rootkeeper is necessary. 3) Copy the 2 files from step 1 into your /cache folder on the root of your system. 4) When the copy operation is complete, using ES File Explorer, tap the zip file in your cache directory and select ROM Manager when it asks you what to use to open the file. 5) ROM Manager will automatically open and prompt you that a reboot is necessary to complete the operation. Hit OK/Accept. 6) The system will reboot and install the ICS leak. Fastboot back to .173 using Matt's 1.51 utility here -> http://www.droidrzr....ows-new-thread/, or RSD. Root your phone using motofail (included in Matt's utility), and install OTA Rootkeeper app from the play store or Matt's utility. You need to be completely stock with no custom recovery EVER installed. You can't just delete bootstrap or safestrap. If you have them or have had them installed then rsd/fastboot back to pure clean stock 173! Move them from your computer to your phone's sdcard or sdcard-ext. Using es file explorer with "root explorer" and "mount file system" enabled in it's settings, copy both files to the root /cache folder (you can navigate quickly through es file explorer using the favorites button at the top. The root folder is the phone with / under it in favorites. Download Rom Manager Free from the market, but do not install clockworkmod. Go into the superuser app and update binaries. Go to Voodoo OTA Rootkeeper app and protect root. Go back to the /cache folder using es file explorer and tap on the .zip. It will give you a few options to open it with. Choose Rom Manager. This will reboot the phone into the stock recovery and flash it. Failure to read and follow these steps will result in failure and frustration! Volume Rocker Skip Track Enabled! Performance that is nothing short of Legendary! 11. Enjoy and thank a dev! All main rom features(Cam, Data, Bluetooth, etc) are working! I Built this whole rom completely blind(except for my excellent testers ) so i may have missed another bug or two, let me know if you find anything! Donating to support all my hard work on this Rom!! Phrir1 for his ridculous testing dedication and themes! East2West for his Skip mod!